Above step installs working proprietary nvidia drivers. After that you can install latest nvidia drivers. This step also removes the problem of noveau interferring with installation if latest driver (run file from nvidia) is directly installed. Then Download the latest driver like “NVIDIA-Linux-x86_64-340.32.run” from nvidia website. You will go to command line. Login Again. If X Sever does not start or system hangs or Command Line, press Ctrl + Alt + Del to restart. Or restart from restart button. After restart. Login, Check Driver version from Start Menu -> Preference -> Nvidia X Server Settings. You can change resolution here. replace mdm by gdm for ubuntu, as linux mint is based on ubuntu and all other steps are same. Then you may log out and log in again by using “root” and your new password. Now, your prompt will always # which is root. In X window, it also mention me as root. You can play lot more Windows games in Wine Emulator, but you need a Windows dvd, which defeats the purpose of playing games natively on Linux. Or you can use Vmware Player to install virtual machine on Ubuntu running Windows 7 on it. You can play games upto Half-Life 2 on Vmware Player. Wine and Vmware Player are free. Cedega is also a good option but it is paid. Right click on desktop, select “Change Desktop Background” from popup menu. Select Wallpaers, Themes, etc. as you want. and then set “Orientation” to “Bottom. If you want the upper tab to be below the bottom taskbar first make it “Top” then make it “Bottom” from properties and thus you can change the order of the taskbars. 6.) Using multimedia and document files, Using Pendrives and DVD’s , Keeping PC virus free. You can use MS Word “.doc” files in Open Office, Adobe Acrobat Reader “.pdf” files in Document Viewer, Winzip “.zip” files in File Roller. These files will open in available application by just double clicking on the files. Use Firefox to view webpages and surf internet. You can also download a plugin for Firefox which make it run in Internet Explorer 8 mode, which is useful for opening sites that demand only Internet Explorer 8 (mainly Asp.net “.aspx” sites, whereas php sites “.php” run better in Firefox). To Compress a folder, right click on the folder and click “Compress”. Using “zip” format is recommended. To Format a drive, right click on the drive and click “Format”. Double Clicking a Windows Partition or right click on the drive and click “Mount”, will mount the Windows Partition in Linux. Inserting DVD’s, or pendrives will automount them. Eject a DVD by right clicking on the mounted DVD drive icon. Better not use DVD writer button, as Ubuntu takes more control of DVD Drives then Windows. Drive may again autoclose if you use the button on DVD writer, do not be surprised at that. To Unmount a drive, Right click on the drive and click “Unmount”. Or “Safely Remove Drive” for Pendrives. You can easily delete all the extra “.exe” files that are virus and “autorun.inf” files on your pendrives. A windows infected with virus (It gets infected first time you just insert the infected pendrive on a Windows PC, even antivirus may allow certain viruses to pass through which it cannot detect). Linux cannot be infected by Windows Virus which is what you get majority of time (Linux Virus can get if you use Internet on Linux, but Linux itself is more secure and there are very few viruses for Linux, also not many people seen interested in making virus for Linux). If you mount Windows partition and still use infected pendrives then also your Windows Partion will be safe as Windows virus does not run on Linux. And Linux virus does not run on Windows. In “Computer – File Browser” go to “Edit – Preferences” Select “Show hidden and backup files”. This will allow you to see all files on hard drives and also on pendrives as virus files are generally hidden. Use select – “Show Hidden and System files” , deselect – “Hide extensions for known file types” from “Folder Options” on Windows also. You can play only these files after default Ubuntu installation, or install “vlc media player” to play all formats. For using files that will not run directly on linux or asks for plugin, download other software from Ubuntu repositories. Linux Mint already has them installed. Right click on file, Select “Make Link” to make shortcut. You can cut or copy and paste the shortcuts wherever you want. You need root permission to install drivers. You can also run “.run” files by double clicking on them. You can also use “System – Administration – Synaptic Package Manager” to install or uninstall softwares from various sources. You can run installed programs by double clicking on their main exe file or go to desired directory by using cd command in terminal and type the name of program. Please note that on Linux Executable files do not have .exe extension (they do not have extension) and plain text files do not have .txt extension (they do not have extension). You will need the required dynamic link libraries present on your Linux. 1) Download the source package. 2) Ensure you have the DEVELOPMENT VERSIONS of the required libraries installed. 3) Change to the src/ directory and type “$ make install”. 4) Re-run the “ProgramName” script from the root “ProgramName” directory if it succeeded. Your settings after running a program or games can be generally found in “/home/user/.ProgramName”. I can’t just click the file left or right click and chose install or to run? I can’t go to the driver manager and just chose the file? I have to type and endless list of commands which must be googled first? Wow, I think I am back to windows in my first day with Mint, if it’s really such pain. And I have decades of computer experience. But I do not accept that I have to enter that much code for a simple driver install. Yes I too now have a decade of computer experience and 5 years linux experience. I also hate to enter a lot of commands for driver install (that too nvidia graphics driver which is easiest on windows) let alone audio or printer drivers which are fortunately already installed. Actually you can double click and run the nvidia installer which will abort with message that you need to close XWindow sytem first. All the commands are for that. For ex. Quake 3 or Open Arena runs directly by double clicking. There must be a big technical problem for nvidia to disable XWindow while it is running and install graphics driver without shuuting it first by user. The problem is with Graphics driver only. After that it is almost as easy as windows (God forbid if you had tried Ubuntu). 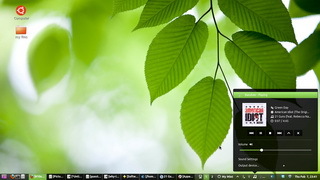 I like Linux and so do others and Mint is best in usability though a lot behind Windows 7 (Win 8 eeks). The more Linux Mint gets used the better it will become. Luckily it is not controlled by some corporation like Ubuntu, but by a community of good people. If after installing Linux Mint Right Click does not work in file manager, Restart computer.